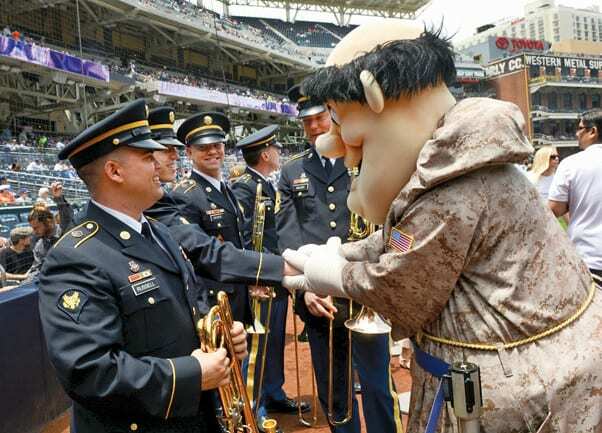 The Padres mascot greets members of the 40th Infantry Division Band of the California Army National Guard. The San Diego Padres major league baseball organization honored the Army’s 240th birthday with a pre-game celebration that included Soldiers and leadership of this installation, June 14. The on-field activities encompassed a cake-cutting ceremony with Col. Jon Braga, Col. Todd Kimura and Pvt. Kareem McLeod. Kimura, commander of Dental Clinic Command here, represented the oldest Soldier and McLeod, of the 11th Armored Cavalry Regiment, the youngest. 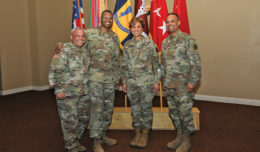 Braga is commander of Fort Irwin United States Army Garrison. 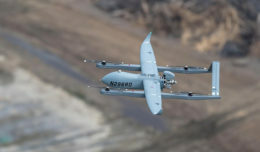 Command Sgt. Maj. Carlos Esmurria, of Fort Irwin USAG, performed a Padres tradition of ringing a bell at their home games. A color guard of non-commissioned officers from the Fort Irwin Sergeant Audie Murphy Club displayed the colors of the nation and the Army. Soldiers also marched onto the field and stood at the first and third base lines of the diamond. 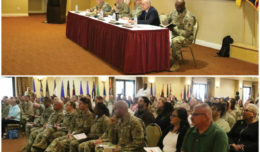 Renita Wickes, community relations officer, said that 54 Soldiers of this installation participated by representing the 11th ACR, 916th Support Brigade, DENTAC, Fort Irwin USAG, Operations Group, and United States Army Medical Department Activity. 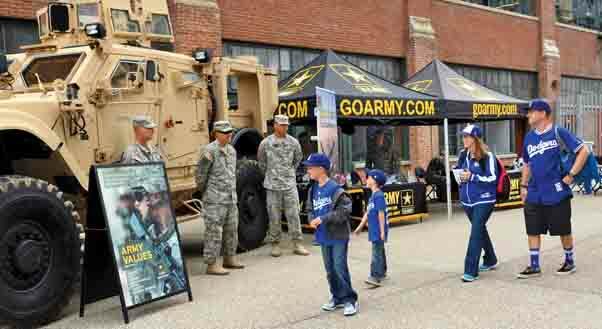 Three Soldiers of 2nd Transportation Company staffed a static display inside the stadium. They spoke with the public and answered questions regarding a M1240 Mine Resistant Ambush Protected vehicle. The Padres played the Dodgers for 12 innings, with the L.A. team winning 4-2. Three Soldiers of 2nd Transportation Company here staffed a static display inside the stadium. (From left) Spc. Ryan Diedrich, Sgt. Aaron Jones and Pfc. Marshall Peterson spoke with the public and answered questions regarding a M1240 Mine Resistant Ambush Protected vehicle. Here – Matthew and Sarah Edgington and their boys, Carson and Kellen of Pasadena, stopped briefly to meet with the Soldiers.